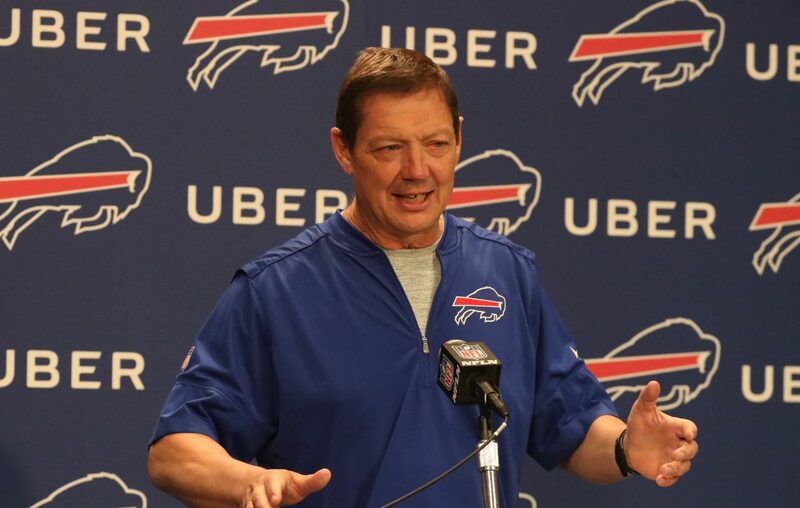 Memories, some painful and some humiliating, came rushing back when Rick Dennison made his first walk through the tunnel of New Era Field as offensive coordinator of the Buffalo Bills. “It was eerie,” he said. Dennison has plenty of training camp recollections from nine seasons as a player and 21 as a coach in the NFL. He’ll add more when the Bills set up shop Thursday at their summer address at St. John Fisher College. But few will be as lasting as his very first experience in the league in 1980, when he was a linebacker on the Bills’ training camp roster. It didn’t end well, which is what made that initial stroll down the tunnel as a Bills coach a bit uncomfortable. Dennison remembers as if it were yesterday, being on a bus as it pulled up to what was then known as Rich Stadium. One by one, he and the other Bills rookies who were housed at a nearby hotel got off, ready for a day of meetings and practice across Abbott Road at the Erie Community College South campus during the final stages of preparation before the start of the season. As Dennison and several other first-year players approached the tunnel on their way to the locker room, however, an assistant coach suddenly stopped them. “You, you, you and you need to go see Coach Knox,” he said sternly. They instantly knew what the meeting with Chuck Knox, the Bills’ head coach at the time, was all about. They were history. “That’s how they did it – before you could get into the locker room and see that your locker was empty,” Dennison recalled with a laugh. For Dennison, this bitter ending in Western New York didn’t happen once. It happened twice. The second time was in 1982. 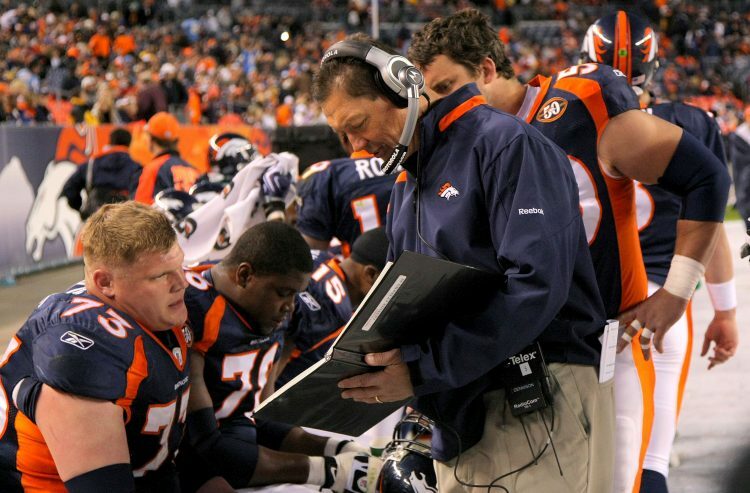 Now, a coaching career path that took Dennison from the Denver Broncos (1995-2009) to the Houston Texans (2010-2013) to the Baltimore Ravens (2014) and back to Denver (2015-2016) has returned him to the place where pro football first entered his life. Friends tell him he has gone full circle. He understands why they would say that, but he doesn’t necessarily agree with them. Having worked so long and for so many teams in the league, Dennison has always treated his professional moves as a matter of being in the right place at the right time. “And this, to me, is the right place at the right time,” he said. Actually, that wasn’t at all how Dennison originally planned to make a living. After getting limited playing time as a tight end and occasional wide receiver during his four years at Colorado State University, he was convinced he had no future in football. He had a bachelor’s degree in civil engineering and had already arranged to pursue a master’s degree at CSU. Dennison was tasked with completing a complicated project funded by the U.S. Forest Service. “My experiment was mass transfer from water droplets, which is evaporation,” he said. “The U.S. Forest Service wanted to know how much of their pesticide was hitting their plants if they sprayed them out of airplanes. One part of the research was working with a laser the size of the water droplets coming off the four or five nozzles that they had. The velocity of the wind tunnel would change based on the free fall of the droplet, which was measured by air resistance. The smaller the water droplet, the slower it fell, thus requiring the wind tunnel to alter speeds as the droplet evaporated. Charley Armey, a scout for the Bills, had stints as a defensive and offensive coordinator at CSU. He was the OC through Dennison’s final two collegiate seasons. 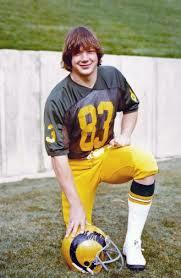 Shortly after the 1980 NFL Draft, Armey called Dennison and told him he should give the NFL a shot. Armey explained that, at 6-foot-3 and 216 pounds, Dennison was too small to be a tight end and too slow to be a receiver, but that CSU needed all of the bodies they could find for those positions. Dennison’s true spot, Armey told him, was linebacker, which he hadn’t played since high school in Fort Collins. Armey put Dennison through a workout at the CSU’s Fort Collins campus. After Dennison ran the 40-yard dash in about 4.7 seconds, the Bills gave him a contract that included a $2,000 signing bonus. Before reporting to training camp at Niagara University in early July, Dennison was able to put his project on hold, assuring the U.S. Forest Service that he would either be back to resume working on it in August or, in the unlikely event he spent the whole season with the Bills, no later than February. Just as when he spent his summer days in college framing houses from 7 a.m. to 5 p.m., Dennison saw Bills camp as another summer job. The moment he reported and noticed the majority of the other linebackers were much larger than him, he was certain he’d be back in the lab by August. On the first day of practice with the Bills, an assistant coach pulled Dennison away from drills to teach him how to get into a proper two-point stance. He needed to rid himself of the habits formed during four college seasons of being in a three-point stance as a tight end and receiver. After about 10 minutes, Dennison was ready to join the workout as an outside linebacker in the Bills’ 3-4 scheme. “I struggled with some things, like being reached by a (blocking) tight end,” he said. “But coverage aspects, all that other stuff, I’m a quick learner. So if it was three-deep, two-deep, man coverage, it didn’t matter. I could sort out who everybody had (in coverage). It was pretty easy to process. Dennison didn’t think that much about it at the time, but he was getting his earliest taste of coaching. And he liked it. Back then, training camp was much longer and more grueling than today. There were two-a-day practices, most of which were full contact. There were scrimmages against other teams (the Bills routinely had them against the Cleveland Browns), as well as four preseason games in which almost every healthy player saw action. Those were big challenges, but they were dwarfed by the fact the Bills were loaded at linebacker. They had Jim Haslett, Shane Nelson, Lucius Sanford, Chris Keating, Isiah Robertson, Phil Villapiano and Ervin Parker, a fourth-round draft pick that year South Carolina State. “Golly! Jimmy Haslett was big and could run and was a nut. He was loud,” Dennison said. “Shane Nelson was short, squatty and would thump anything. If it moved, he’d hit it. Lucius Sanford … holy cow, was he good. He was long and he could run. Ervin Parker was big and could run, too. His situation wasn’t made any easier by some of his teammates on the other side of the ball. Topping the list was guard Conrad Dobler, known at the time as the dirtiest player in the NFL. His signature illegal tactic was the leg-whip, where he would plant one foot while swinging his other leg around the back of it to trip an oncoming defender. Dobler was even was known to occasionally bite opponents. Dennison felt fortunate that, as an outside linebacker, he didn’t have to deal with Dobler as often as his teammates on the inside. However, there was one practice before the Bills’ first preseason game in 1980 when Dennison was assigned to rush in Dobler’s direction on a stunt. Rather than collide with Dobler, Dennison juked him, leaving Dobler awkwardly trying to block air – and beyond furious. Today, the Bills, like every other NFL team, continue to provide players with meals during the workday after camp breaks and there’s no longer training-table service. That wasn’t the case in the 1980s. The veterans were well aware of that, of course, so they’d give the kickers, who had the most free time during practice, money for a lunch run. Dennison and the rest of the rookies weren’t aware of the arrangement. There were others in his position group who showed Dennison some compassion. Villapiano and Sanford noticed how much he was struggling on the field, and would periodically take him aside for about 15 or 20 minutes of post-practice tutoring. Dennison can still picture Knox, who had a larger-than-life aura, puffing on his ever-present cigar. Dennison was never quite sure if the head coach even knew his name, especially because Knox spent little time around the defense. That was the domain of defensive coordinator Tom Catlin. But none of Catlin’s coaching was able to allow Dennison to avoid the inevitable. After receiving minimal playing time through the first two preseason games, the Bills released him. Dennison returned to his research project. Once again, he thought he was done with football. But he spent much of his free time working out, thanks to the fact his uncle, a former CSU football player, was the strength coach at the school and gave his nephew access to the gym whenever he wanted. At the end of the 1980 season, the Broncos offered Dennison a chance to audition for a roster spot and signed him to a futures contract. He remained with Denver until the final cut of the 1981 preseason. That had to be the end of the line, right? Not quite. Dennison received interest from a couple of teams in the Canadian Football League, but wasn’t interested. In December, Armey called again and gave him another shot to make the Bills’ roster during their 1982 training camp at Fredonia State. The good news was Dennison would be working with the same coaches, in the same defensive system from two years earlier. The bad news was that most of the same linebackers were on the team and would be no easier to supplant. Finally, he was ready to launch the career he had wanted all along as a civil engineer. He had interviews lined up to work in air-pollution control, and was confident that he would be hired. Dennison and his girlfriend at the time (who would become his first wife) packed up his car and began driving back to Fort Collins. They stopped in Chicago, where one of Dennison’s former college roommates lived, to break up the trip. Meanwhile, he called home to find out, much to his surprise, the Broncos and Philadelphia Eagles had left messages that they were interested in signing him. Dennison picked the Broncos. This time, he would stick with them until he retired as a player in 1990. Through the years, Dennison would be involved in plenty of games, as a player and coach, at the stadium his current team calls home. “Some unfortunate ones and some good ones,” he said. But none would overshadow that first summer in Western New York, brief as it might have been. For Dennison, there was nothing better than finding himself doing what he never expected to do after his final college game – putting on the uniform of a professional football team. 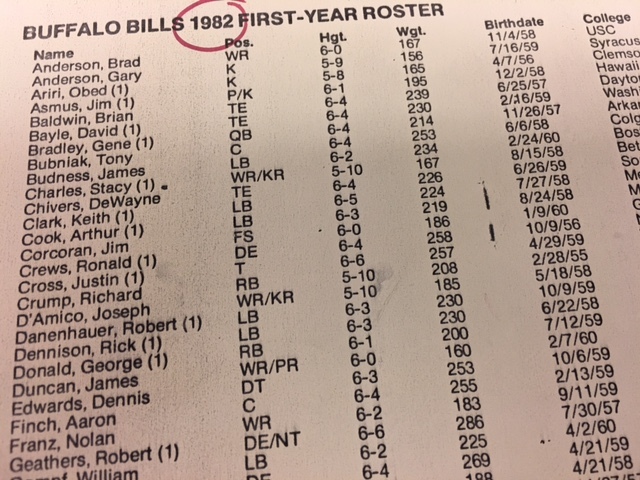 Today, Dennison contributes to the process of determining which Bills rookies who have made the same journey to WNY he made 37 years ago get to keep wearing that jersey … or must surrender it, as he eventually had to do.